At least half the work in writing is organizing your text: Sometimes it feels like having a conversation with yourself that you end up sharing with the world once it makes sense. Turning a jumbled mass of ideas into a coherent article, or even a book, isn't easy, but Scrivener helps. Scrivener's interface can seem busy at first glance, but you can switch most of it off when you don't need it. While it can sometimes feel like an overwhelmingly complex writing toolbox, Scrivener revolves around a single concept: No matter how massive a text is, it's invariably made up of smaller parts. A chapter isn't as scary to write as a whole book; a single paragraph is even more approachable. You could certainly author a novel or a big employee guide using just a text editor or word processor, breaking down each chapter into its own file. But what if you then wanted to review all scenes with a particular character, or at a particular location? What if you wanted to rearrange the hierarchy? 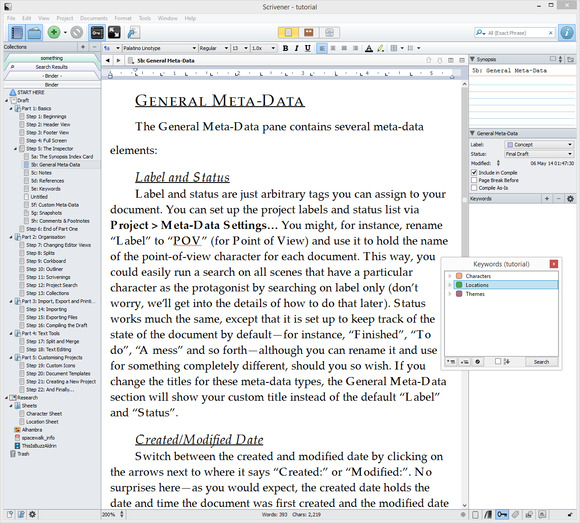 By putting all of your writing into a database, Scrivener makes such tasks trivially easy. The corkboard is one way to get an overview of your text. First, let's take a bird's-eye view of your text. 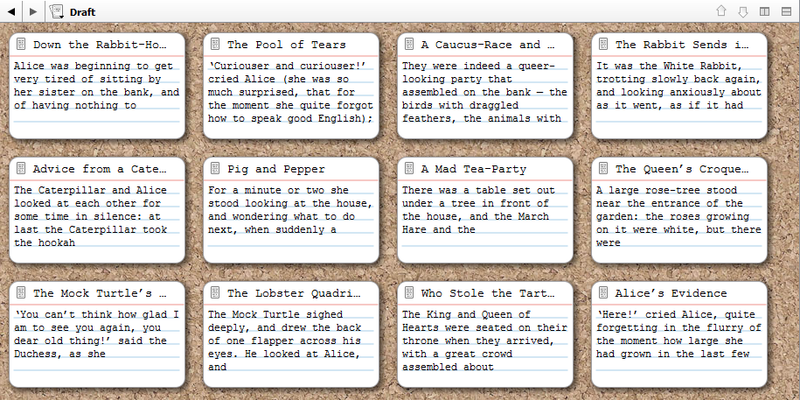 To do this, Scrivener uses a somewhat old-fashioned "corkboard" metaphor. 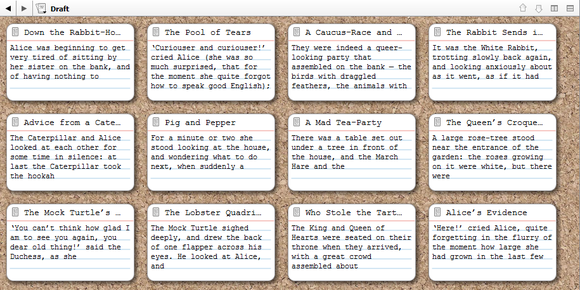 Each of your documents (chapters, sections, up to you) has a little index card attached to it. This index card can say anything: It's a little synopsis of your text, just for your own use. In corkboard mode, you see just the index cards, which makes it very easy to rearrange scenes around. If you're more into traditional outlining software, you'll like the outliner mode better. It's the same concept—taking a sweeping look at your text to see how it all goes together, rearranging the parts as needed. Metadata, such as labels at statuses, can help you sort out a large body of work and see where everything stands. Synopsis cards are not the only way to mark your text. Each document in your project can have a status (first draft, revised draft, done, etc.) as well as a label (concept, chapter, and more). Additionally, Scrivener has a keyword feature which lets you build up your own custom hierarchy of keywords—for example, all character names in your book, or even by the mood of the scene. Combined, all of these attributes let you perform fine-grained searches: Find all the "second draft" scenes that have both Hodor and Bran that take place outdoors. That's something you just can't do with a bunch of text files in a folder. Once you find a collection of documents (chapters, scenes), you can either read them one by one, or—cooler still—select them all and view them as one long stream of text, as if they were all a single document. This is a great way to zoom out again into the broader context of your book or manual. You can use this to read just one plotline consecutively, even if in your work it appears interweaved among other locations and happenings. 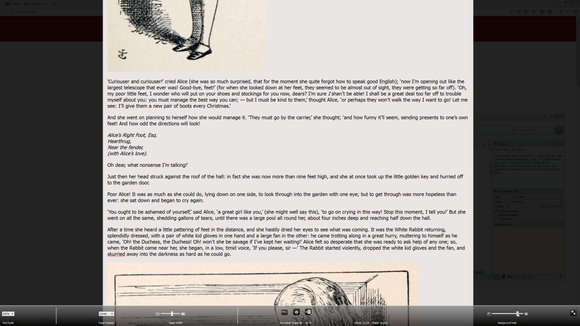 Scrivener's full-screen composition mode is one way to focus on your text. Of course, before you can slice and dice all of these scenes, they have to exist first. To have a book, you need to get some writing done. Scrivener's built-in editor feels like a word processor. You can make text bold or italic, play with font sizes, and color individual words. If you're used to working in a word processor, you'll find this handy. For me, it was more of a distraction: I wish there was a way to completely switch off the rich text engine and end up with something that feels like WriteMonkey, a minimalistic writing environment that leaves you just with your words. 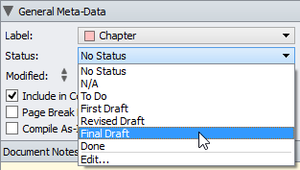 Scrivener is almost there. It already features robust support for MultiMarkdown, a writing syntax that lets you mark words as bold or italic, set out headlines, and make links without having to fiddle with any buttons. It also has a beautifully executed full-screen mode that blacks out everything else, leaving you with just your text...and the rich-text engine. Comprehensive as it is, there are a few things Scrivener will not do for you. For one, it won't check your grammar, unlike these other writing tools. When writing fiction, this is not a bad thing, but if your writing leans more towards the technical or business end of the spectrum, grammar- and usage-checking can make a difference. Scrivener also won't help you brainstorm your plot. That's something developer Literature and Latte made into its own app, Scapple, which works as a freeform mindmapper that lets you jot down your ideas any which way, and then import them into Scrivener for fleshing out. All in all, Scrivener is a writing powerhouse, but rather than make the prospect of writing a novel scarier, it makes it more approachable. The core concept—taking a big document and breaking it into manageable chunks—works. You won't use everything Scrivener has to offer, and that's a good thing. It has features to spare. Writing a long text is hard but Scrivener makes it seem less scary.